NEW CLEAR WINDSHIELD FOR 1928-31 FORD MODEL A TRUCK, TUDOR, COUP E, FORDOR, TOWN SEDAN, PANEL TRUCK, AND STATION WAGON. (DOES NOT FIT OPEN CAR, ROADSTER, PHAETON, OPEN TOURING, FORDOR MODELS 60A, B LEATHERBACK OR 60C STEELBACK) INCLUDES 1 WINDSHIELD. ALL GLASS IS CUT IN OUR SHOP FROM ORIGINAL FORD PATTERNS GUARANTEED TO FIT EXACTLY LIKE YOUR ORIGINAL GLASS PARTS. WE CARRY GLASS FOR NEARLY EVERY AMERICAN CAR AND TRUCK FROM THE TEENS TO THE 1970'S. The item "1928 1929 1930 1931 FORD MODEL A WINDSHIELD CLOSED CAR and TRUCK CLEAR" is in sale since Tuesday, January 29, 2013. 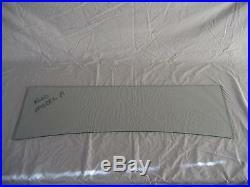 This item is in the category "eBay Motors\Parts & Accessories\Vintage Car & Truck Parts\Glass". The seller is "silex210" and is located in Tolland, Connecticut.